Back one hot August summer in the 1920s, the Devil roamed the streets of East Joplin. 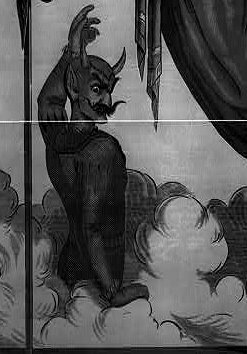 A number of women and children reported a tall figure that resembled Beelzebub jumping out of the darkness at them and then running away. Mrs. W.H. Longacre watched in horror as a satanic figure ran in front of her car as she drove her children home. Mrs. Longacre’s report to the police went unheeded. Doors were locked, windows were barred, and a small group of East Joplin men prowled the streets with their shotguns loaded. Rumors swirled as to whether or not it really was Old Scratch or just some harmless prankster. Some believed it was a prankster who wore armor underneath his costume to keep him safe from harm. After it became known that men were searching for the Devil armed with shotguns, Vard I. Cowan, a laborer for the Southwest Missouri Railroad Company, confessed to playing tricks on unsuspecting victims. He had used it at a church party earlier in the year and had such a good time that he continued to play tricks on residents the rest of the summer. There were no further reports of the Prince of Darkness lurking on the streets of East Joplin.